The Mountain Railways of India are three fully operational railway tracks that are fine examples of 19th century technology and the changes they brought with them. Darjeeling Himalayan Railway: the first of the railways to become a WHS; it is a 86 km long narrow gauge railway from Siliguri to Darjeeling in West Bengal, built 1879-1881. It uses zigzags, with traction reversal and spirals. 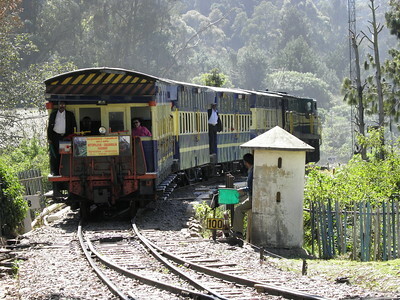 Nilgiri Mountain Railway: a rack railway of 46 km long between Mettupalayam and Ooty in Tamil Nadu; it includes original stations, rolling stock and steam locs. Kalka-Shimla Railway: a narrow gauge railway from Kalka to Shimla in North-West India. It uses very heavy and complex engineering, including multi-arch viaducts, tunnels, retaining walls and a very large number of curves, in order to overcome the mountain conditions. I had taken as much as precaution in visiting this WHS as in arranging a visit to Da Vinci’s Last Supper. More than 3 months before I reserved a first class ticket on the Nilgiri Express. And even at that moment I could not get my preferred date, and decided to take the trip down from Ooty instead of upwards to it. The first class seats are located in a small, open carriage that give you good views and photo opportunities during the ride. And what a ride this is! The Nilgiri Railway was finished in 1908, and a trip up to Ooty from then on took only a couple of hours instead of 10 days. This way the mountainous region was opened up totally and attracted a lot of settlers. The railway is 46km long and uses a rare rack railway system: in the center of the tracks lies another rail, with tooths where the train gets some extra grip. It was made with a Swiss technique, and is considered to be the most authentic rack railway system still in use. Almost all of the 12 stations underway are original. The WHS also includes the rolling stock, as it was considered by ICOMOS to be “irremoveable” – it can’t be used anywhere else. The trip covers 3 distinct parts: the first part (when going down) from Ooty to Coonoor has the best scenery. After every curve or tunnel – and there are many on this ride – there a gorgeous views on the surrounding mountains, the tea plantations, forests of eucalyptus trees and tiny villages that made me think I was in Nepal. At Coonoor the second part starts: it is here that the steamloc is connected to the train and the rack railway is used. You can hear it rattle underneath the carriages. Here you will cross many of the 31 major bridges, where it seems that the train is flying over the depths beneath. The last part to Mettapulayam goes down very quickly into the plains. I can’t testify for one of the other two Mountain Railways, but this Niligiri Express is certainly a must do! And not only for railway buffs: I enjoyed the scenery even more than the features of the railway system. The ride down takes 3.5 hours, and I wasn’t bored for a second. Shimla (or Simla) can be approached by air/train/road. Although the train takes longest time (some 6 hrs)from Kalka, journey is certainely a worthwhile. Forest goes all along the route while the train moves to higher altitude (from 300 m to 1900 m above sea level), and it is very pleasant to see the sunrise across hills and valleys. A cup of tea at any station is not only refreshing, but has got a good taste too. As the journey starts, many people try to find seats in the train, but after few minutes, everybody seems to get off the seat and peek out of any opening available. I would recomment to go in non-deluxe train for real experience. And don't be shy to shout loud if you like, while the train passes through several tunnels. Nice site. I too had the occasion to travel on the 2' gauge DHR from Darjeeling to Ghoom [8km]in the diesel-loco [NDM-6 #602] hauled train going to New Jalpaiguri, in May 2008. However, a steam-engine hauled train was also there, but it was fully booked, being Tourist Special from Darjeeling to Ghoom and back. I have taken a video of this in heavy rain, balancing a camera in one hand and an umbrella in the other! On the Nilgiri Railway, the vintage Swiss built steam engines continue to run on the steep rack section between Mettupalayam and Coonoor, after which a bio-diesel powered YDM-4 mainline diesel engine brought from the plains runs for the remainder of the route upto Ooty, being a normal adhesion line. Three of the 1952-vintage steam engines have been successfully converted from coal firing to oil firing mode at the Railways workshop in Tiruchirappalli, and these are also in operation. Two of these can be seen in my videos - Engine Nos. 37395-X and 37391-X. By the way, a 3rd WHS railway has been added on Jul 7, 2008 at the UNESCO meeting in Quebec - this is the 96km narrow gauge Kalka to Simla railway, operating on a gauge of 2'6". It is possible that the Niligri Hill rack railway from Metupayalam to Ooty might soon be added to the WHS list but the Darjeeling Himalayan Railway (DHR) from New Jaipalguri/Siliguri to Darjeeling is already inscribed. The World's industrial heritage is certainly not over-represented on the WHS list . I have travelled in trains in all over india from to Ooty in the steam train, from Madras to Coimbatore, Puna, to Bombay, To Delhi, to Agra, Trichi,Triviandrum Cochin,trissur,over and over..etc. That is the best I enjoy and I enjoy looking at trains, reading, etc..etc..
Travelling by steam on the DHR was a great experience. Having been raised in Coimbatore as a kid one of the joys was taking the Nilgiri mountain rail trip from Mettupalayam (which is just 20 miles from my home town) to Ooty (now Udhagamandalam). This rail road has been shot in a lot of Tamil movies. This gives a feeling of familiarity even when you take the trip for the first time. The slow pace of the trip offers a relaxed way to catch the scenery! Some stretches makes one wonder how they managed to construct the rail road! India possesses a number of “Hill Railways” built by the British to aid government officials and others in their escape from the major cities to the nearest Hill Country. It is possible that the Niligri Hill rack railway from Metupayalam to Ooty might soon be added to the WHS list but the Darjeeling Himalayan Railway (DHR) from New Jaipalguri/Siliguri to Darjeeling is already inscribed. The World’s industrial heritage is certainly not over-represented on the WHS list and I only know of 3 railway related sites (The DHR plus Semmering in Austria and the Mumbai Railway Station). The DHR was built between 1879 and 1881. It climbs from 398ft to 7407ft in 47 miles before dropping slightly to Darjeeling after 51 miles (apologies to those who only understand “metric” but we are talking about a British built railway!). It is an excellent trip even for those who are not “railway buffs”. Its gauge is 2 ft and, unlike the Niligri railway, has no rack or cog to help with traction. One of the delights of the journey by steam was seeing the man sitting on the front dropping sand from a box onto the line in order to assist traction (see photo)! The ascent is achieved both by a relatively steep gradient but also by “tricks” such as a complete spiral. At this point the more energetic passengers jump off the train, climb up the bank and await the train’s return after completing the circle! Another technique is a “reverse” whereby the train zig-zags its way up a particularly steep section. The scenery on the route up is superb and Darjeeling itself is a worthwhile destination in its own right. Unfortunately regular full-journey steam journeys are currently a “thing of the past”. This seems to be the way of things - the Kalka- Simla railway has been electrified as has (partially) the Niligri railway which is pulled by diesel from Coonoor to Ooty. Perhaps if the Niligri railway gets WHS status this will help preserve the Steam Locos – though, ironically, the DHR received its WHS inscription in 1999 around the same time as plans were being made to phase out steam. I have indeed seen reports of plans to replace the Niligiri steam locos by diesel so, if you want the full experience – go now!!! This states that, apart from chartered steam trains for groups of enthusiasts, the only steam journeys now are short journeys out of Darjeeling. The attempt to produce an oil-fired steam loco appears to have failed (Though “The Hindu” of Mar 4 2005 reports of modifications and another trial!). Travelling by steam on the DHR was a great experience. Even if steam is no longer available I would still recommend the trip but inevitably some of the experience/romance will have vanished. Sic transit gloria mundi! Tunnels: The Kalka-Shimla railway has 102 tunnels in its 96 kms. Originally there were 103 but tunnel no46 doesn't exist any more! Summer residences: Darjeeling, Shimla and Ootacamund were all developed as locations for the British Raj to escape the heat of the lowlands and the railways were created to give them easy access. Tea: AB describing the route of the Darjeeling Railway "finally the 30km alpine section to Darjeeling, dominated by stands of Himalayan pine and tea gardens." Works by Nobel Prize winning authors: Plain Tales from the Hills by Rudyard Kipling. 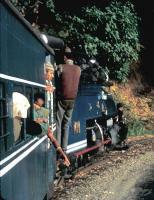 Many set in Simla (now Shimla, part of Kalka-Shimla Railway).